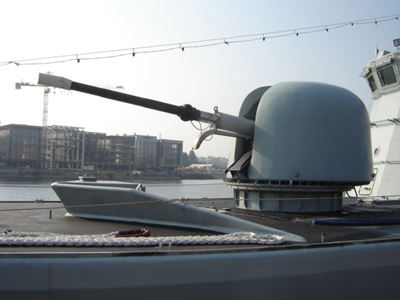 The 76 mm Mk M/85 seen here on the patrol vessel STØREN in Sonderborg 2005. This model is an improvemnet over the 76 mm Gun Mk M/71 LvSa with an improved rate of fire, specially for handling incoming missiles. on this weapon or weapon system?